This was to be the prelude to a popular revolt in the Midlands during which James’s nine-year-old daughter, Princess Elizabeth, was to be installed as the Catholic head of state. 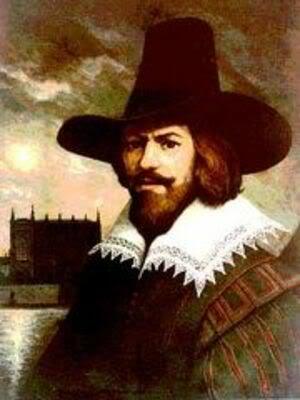 Guy Fawkes was born on 13 April 1570 and was educated in York. His father died when he was eight years old, after which his mother married a recusant Catholic. Fawkes later converted to Catholicism and left for the continent, where he fought in the Eighty Years’ War on the side of Catholic Spain against Protestant Dutch reformers. He travelled to Spain to seek support for a Catholic rebellion in England but was unsuccessful. Whilst in Spain he met Thomas Wintour, with whom he returned to England, and Upon their return, Wintour introduced Fawkes to Robert Catesby, who wanted to assassinate King James. So The plotters then secured the lease to an undercroft beneath the House of Lords, and Fawkes was placed in charge of the gunpowder they stockpiled there. Jonny Greenwood, guitarist with English rock band Radiohead was born Born 5th November 1971 Formed in 1985, Radiohead hail from Abingdon, Oxfordshire, and The band consists of Thom Yorke (lead vocals, guitar, piano), Jonny Greenwood (lead guitar, keyboards, other instruments), Colin Greenwood (bass), Phil Selway (drums, percussion) and Ed O’Brien (guitar, backing vocals). Radiohead released their debut single “Creep” in 1992. The song was initially unsuccessful, but it became a worldwide hit several months after the release of their debut album, Pablo Honey (1993). Radiohead’s popularity rose in the United Kingdom with the release of their second album, The Bends (1995). Radiohead’s third album, OK Computer (1997), propelled them to even greater international fame. Featuring an expansive sound and themes of modern alienation, OK Computer is often acclaimed as one of the landmark records of the 1990s. Kid A (2000) and Amnesiac (2001) marked an evolution in Radiohead’s musical style, as the group incorporated experimental electronic music, krautrock and jazz influences. Kid A, though somewhat polarizing at the time of its release, is now frequently recognized as one of the most important albums of the 2000s. Hail to the Thief (2003), a mix of piano and guitar driven rock, electronics and lyrics inspired by war, was the band’s final album for their major record label, EMI. Radiohead self-released their seventh album, In Rainbows (2007), as a digital download for which customers could set their own price, and later in physical form to critical and chart success. Radiohead’s eighth album, The King of Limbs (2011), was an exploration of rhythm and quieter textures, which the band released independently. Radiohead have sold more than 30 million albums worldwide, with the band’s work being placed highly in both listener polls and critics’ lists, they have the distinction of doing so in both the 1990s and 2000s. In 2005, Radiohead were ranked number 73 in Rolling Stone’s list of “The Greatest Artists of All Time”, while Jonny Greenwood and Ed O’Brien were both included in Rolling Stone’s list of greatest guitarists, and Thom Yorke in their list of greatest singers. In 2009, Rolling Stone readers voted the group the second best artist of the 2000’s. In 1994 he collaborated with Rod Stewart and Sting for the single “All for Love” written for the Motion Picture Soundtrack of the movie Three Musketeers. The single topped the charts worldwide. It was followed in 1995 by, “Have You Ever Really Loved a Woman?” (song released with the Motion Picture Soundtrack of the movie Don Juan DeMarco)., Adams’ next album 18 til I Die contained the UK Top 10 singles “The Only Thing That Looks Good on Me” and “Lets Make a Night to Remember”. Then In December 1997, Adams released MTV Unplugged with three new tracks: “Back to You”, “A Little Love” and “When You Love Someone” this was followed by “I’m Ready”, an acoustic version of the Cut’s Like A Knife track. The album was a top 10 success in Germany while both singles reached the top 20 in the UK.On a Day Like Today was released in 1998 generated two British Top 10 singles: “Cloud Number Nine” and “When You’re Gone”, a duet with Melanie C of The Spice Girls. To commemorate the millennium, Adams released The Best of Me, his most comprehensive collection of songs at that time, which also included two new songs, the title track “The Best of Me” and “Don’t Give Up”.